OK...well..a wild weekend! I did my act and it was cool. I could've done with more practice but i pulled it off. A friend Rachel, was my side kick dancing girl. I was in bowler hat, sparkly skull t-shirt, mini shorts , gym shoes and long teddy bear claws. It was a very rokin roll night really. We had a hall which we decorated. I love being back stage with the girls all dressed up. There were many magic moments as we entertained the crowd. The next day we were all 'munted' from the nights high flying activitys. We drove to a masive hill and had a picnic with a far out view. Hot, sunny...sunburn. And then a long drive home. 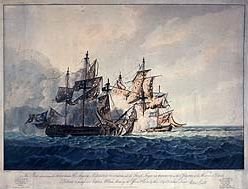 The picture seen here is a battle in which some realitive MOUNSEY was the captian of. Its like me on stage, battling it out with argumentative reality.